In response to public outrage generated by the video, the U.S. Department of Agriculture suspended operations at the plant. A few weeks later the company announced it would “voluntarily” recall 143 million pounds of beef deemed unfit for human consumption, a third of which had gone to the nation’s school lunch program. A year later the company was out of business. “What you are about to see is beyond your worst nightmares, but for animals raised on modern intensive production farms and killed in slaughterhouses it is a cold inescapable reality. Once you see for yourself the routine cruelty used in raising animals for food you will understand why millions of compassionate people have decided to leave meat off their plate for good. Videos such as these have made big food processing corporations very nervous; so nervous that they have successfully lobbied state legislatures to implement “ag gag” laws, which criminalize undercover photography or video inside animal farms. Such laws currently exist in five states–Iowa, Kansas, Montana, North Dakota, and Utah–and they are pending in five others. There is little doubt that factory farm videos have successfully swayed public opinion in support of more humane treatment of animals. Veal crates, for example, where young calves are kept in strict confinement, have been banned after voter referendums in Arizona and California. Earlier this year Burger King announced an agreement with the HSUS to switch completely to so-called cage-free eggs by 2017. Last year HSUS entered into an agreement with United Egg Producers, a major industry trade group, to work together to enact federal legislation to ban battery cages for all 280 million laying hens in the United States. In May, McDonald’s announced that by 2022 it will no longer buy pork from producers who use gestation stalls to house their pregnant sows. A few days after the McDonald’s announcement, Safeway, the nation’s second largest supermarket chain, followed suit. But this is not the first time in American history that social activists have influenced public opinion about how their food is produced. “I aimed at the public’s heart and by accident I hit it in the stomach,” lamented Upton Sinclair after the 1906 publication of his book The Jungle, which chronicled the appalling working conditions in Chicago packinghouses at the turn of the 20th century. But instead of being incensed at how workers were treated, as Sinclair intended, the book’s readers were horrified by its description of filthy packinghouses and tainted meat. Within a few months of the book’s publication, President Theodore Roosevelt signed into law the Meat Inspection Act and the Pure Food and Drug Act, which help protect us to this day. Fast forward to 2004 and Human Rights Watch issues a detailed study entitled Blood, Sweat, and Fear: Workers’ Rights in U.S. Meat and Poultry Plants. It reported on interviews with workers in a Nebraska beef plant, a North Carolina hog-slaughtering plant, and an Arkansas chicken-processing plant. Its pages chronicle hazardous working conditions and illegal company tactics to prevent union organizing. It carefully documents how companies deny workers’ compensation claims to employees hurt on the job by failing to report injuries and firing those who file claims. This report, unlike The Jungle, did not produce any significant legislation. 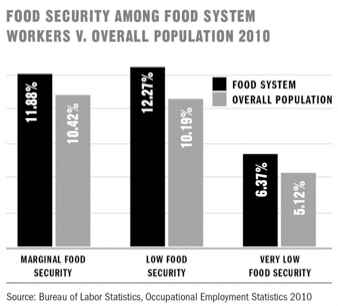 In June 2012, the Food Chain Workers Alliance, a coalition of worker-based organizations whose members plant, harvest, process, pack, transport, prepare, serve, and sell food, issued a report called The Hands that Feed Us. It is an all too familiar litany of complaints–from low wages to high injury rates to minimal or no benefits. Complaints by workers and unions against packinghouse working conditions have largely fallen on deaf ears. Indeed the federal government has made it harder for these groups to document such complaints. One of the most common work-related injuries in a packing plant is carpal tunnel syndrome, a musculoskeletal disorder caused by repetitive motions that can lead to a crippling of the hand or wrist and the inability to grip or even pick up objects. “In 2002, the federal government’s Occupational Safety and Health Administration stopped requiring employers to report such injuries. And so, as if by magic, the rates for repeated trauma disorders went from 8.1/100 workers in 2000 to who knows what in 2010? Despite the many detailed exposes of miserable working conditions in packinghouses and factory farms in books such as Eric Schlosser’s Fast Food Nation and our own Slaughterhouse Blues – the public seems far more concerned about the welfare of farmed animals than the welfare of those who turn them into meat for our tables. In a 2010 national survey by Context Marketing, 69 percent of respondents said they would willingly pay more for “ethically produced” food. When asked what they meant by “ethical food,” more than 90 percent identified three main qualities: “protects the environment, meets high quality and safety standards, and treats animals humanely.” Working conditions and wages of food processing workers were not among the criteria for “ethical” food! The meat and poultry industry is responding to public concerns for the welfare of farmed animals. If public outcry over the plight of meat and poultry workers was loud enough, if pressure were strong enough, companies would hear, and they would respond. What is our excuse? Meat and poultry workers are animals too. Michael Broadway is professor of geography and dean of Arts and Sciences, Northern Michigan University. He can be reached at mbroadwa@nmu.edu. Don Stull is professor of anthropology, University of Kansas. He is also on the board of directors of the Organization for Competitive Markets. He can be reached at stull@ku.edu. Their most recent publication is Slaughterhouse Blues: The Meat and Poultry Industry of North America. Second Edition (Wadsworth, 2012), which integrates what they have learned from three decades studying the industry and its impact on communities, farmers, processing workers, and farmed animals.